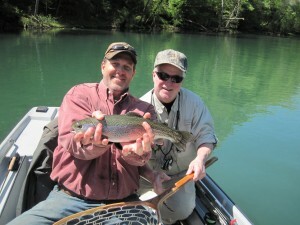 Dan, who is an experienced fly fisher, brought his duck hunting buddy from Little Rock, Carter, to the Little Red River to introduce him to fly fishing. Carter is one of the fastest learners we have ever had in the boat. 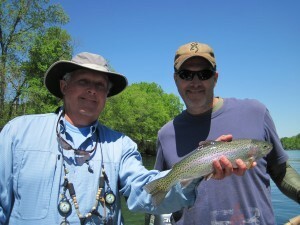 We really got on a lot of fat Rainbows at least six of which were within the slot. Dan took some fish early on streamers while Bo rigged Carter with a pink San Juan Worm and did a little work on his casting. As you can see in the second photo, enough fish were caught that after lunch Dan and Carter had a short nap to get ready for the afternoon action. For the afternoon Bo riggged 5wt. rods with pink San Juan Worms and either a #12 dark gray Sowbug or a #12 RG/PT Cruiser Magnum as droppers. Late in the afternoon Carter landed his first Brown Trout to cap off a really great first day of fly fishing! 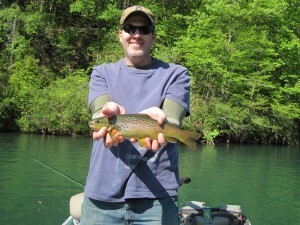 The spring fishing on the Little Red River is just super and should only get better as we get later into spring. 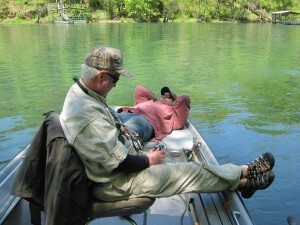 Give us a call at 479-459-7071 to book your spring fly fishing trip.